AMBS won the competition for the Baghdad Spa situated in the Ministry of Youth and Sport City. 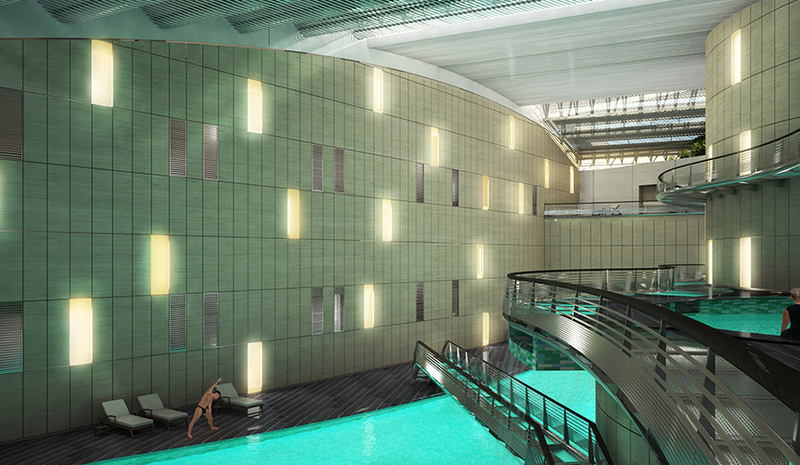 The Spa will provide a tranquil recreational space to relax and enjoy its restorative benefits. Two central sunken pools are overlooked by two smaller pools at a mezzanine level, from which water cascades. The view out is directed towards the natural lake. The five concrete fin walls are over-sailed by a roof structure formed from louver-like beams and skylights, which create an ambient play of light and shadow. Along with aquatic amenities the spa includes two restaurants and a coffee shop. The design is a beautiful and modern construction at the vanguard of engineering that expresses refined Iraqi culture.